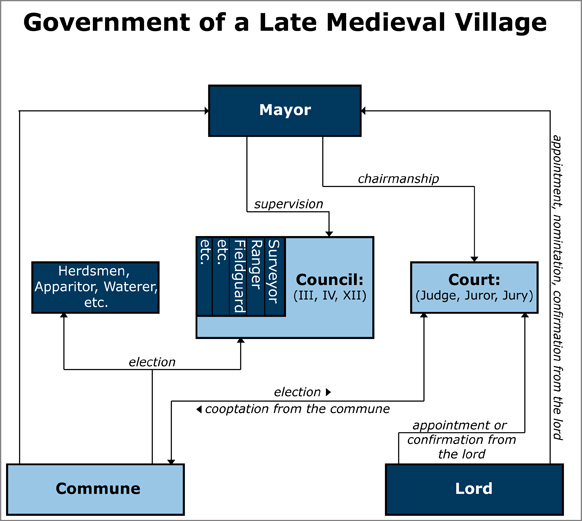 The following diagram is a functional model of the government of a typical late medieval village. In terms of structure, the government was a mixture of lordship and communal autonomy. That elements of village governance so strongly resembled those of town governance suggests the existence of fundamental principles of late medieval local governance in the German lands. Source: Peter Blickle, Obedient Germans? A Rebuttal: A New View of German History. Translated by Thomas A. Brady Jr. Charlottesville, VA: University of Virginia Press, 1997, p. 18.